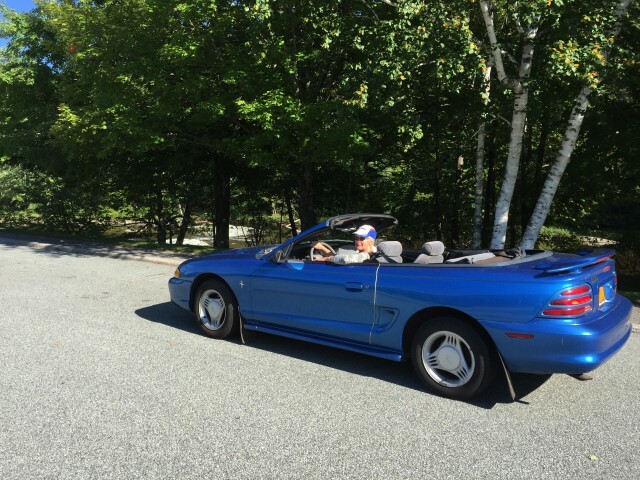 When we begin to notice the late-summer sun slanting more and more toward fall, I like to hop into our bright blue 1995 Mustang rag-top, put the top down and ride around the North Country with the wind whipping around and the sun beating down. A convertible is especially great for viewing fall foliage this time of year. Although the foliage hadn’t really started on this third week of September (kind of unusual actually), the views were spectacular, the temperature hovered in the 80s and the sky was a cloudless deep blue. The sky and my Mustang pretty much matched! One of my all time favorite rides is the loop from Wilmington to Upper Jay, then to Jay and back to Wilmington. There’s great scenery as well as fun places to stop and shop or grab a bite to eat. Plan the ride sometime when you have no schedule, so you can take your time and take it all in. According to Google Maps the drive could take as little as 22 minutes. However you really could spend a good portion of the day if you stop and enjoy everything there is to see. I started my drive in Lake Placid where I live, but if you’re staying in Wilmington I’ll start this drive off at the “four corners," the intersection of Route 86 and the Whiteface Memorial Highway. 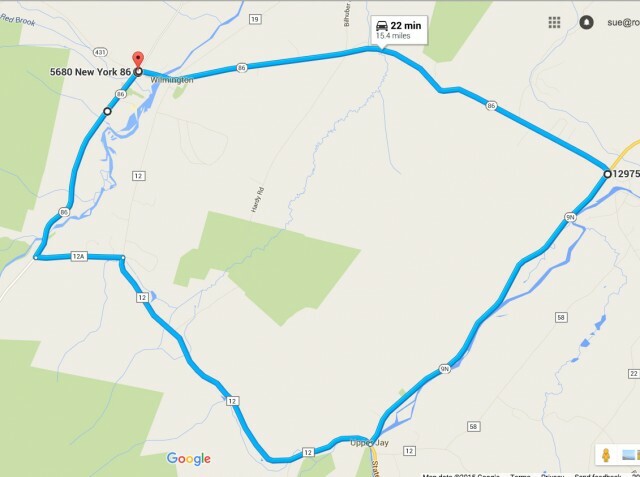 Take NY State route 86 toward Lake Placid for a little over 2 miles and turn left on Fox Farm Road. Proceed to the end of Fox Farm Road and turn right on Springfield Road (County Route 12). Continue on Springfield for about 3 1/2 miles to the end. 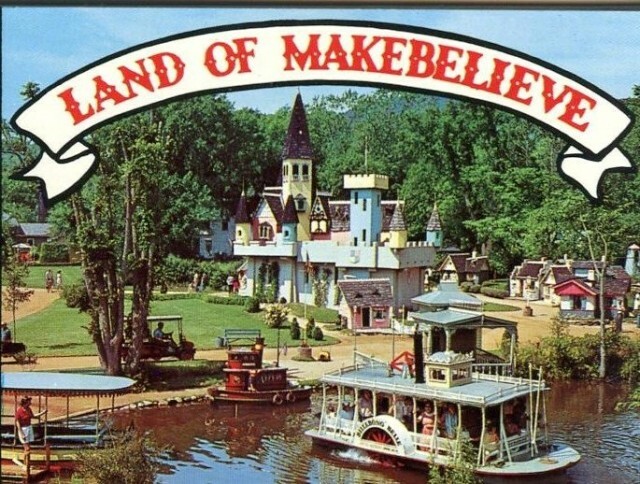 Welcome to Upper Jay, former home of the Land of Makebelieve, one of the very first theme parks in the country. It’s called Upper Jay because it’s upriver from Jay, the next town down river. You'll find yourself at a three-way intersection with a bridge on the other side. Upper Jay has great history and some pretty cool buildings to visit. Directly across the bridge on the left is the site of one of America's first theme parks - The Land of Makebelieve. Visitng this attraction was one of my all-time favorite things to do as a little kid, although there’s not really much there any longer except the closed up main entrance building. On the property stood one of the most creative and wondrous attractions for children ever! Fans of the attraction spent a lot of time and energy trying to restore what was left of the park after several floods ravaged it over the years. The park itself closed in 1979, but much remained that historians and fans were in the process of preserving. Nature took its final toll on the Land in 2011 when Hurricane Irene’s floodwaters ravaged what was left and attempts to salvage any more relics were halted. The creator, Arto Monaco, worked at MGM and Disney studios before returning to his beloved Adirondacks to collaborate on several local theme parks such as this and Santa’s Workshop in Wilmington (more on that later). If you’re interested in learning more about Monaco and the Land of Makebelieve, this video has lots of vintage video and photos. You’ll be able to see what sat right here before you on this very spot. It was truly a magical place! At the intersecton turn left on Route 9N. The drive will take you along the Ausable River and the lush countryside of valley. If you love small libraries, make sure to stop at the Wells Memorial Library, located on the right a short distance from the intersection near the bridge. This is one of the smallest but most well cared for libraries in New York State, and listed on the National Register of Historic Places. It, too, was ravaged by the floods of Irene in August of 2011. They lost more than half the collection, including all of their children’s books. Thanks to the valiant efforts of the local citizens, and grant money as well as donations, Wells Library has been fully restored and the collection has grown remarkably due to the generosity of many area residents. It’s a beautiful little building and well worth a visit. Its hardwood floors, wood shelves, Stickley furniture and decorative fireplace create a warm and welcoming environment. There are regularly rotating art exhibits on the walls as well. Arto Monaco donated a hand-crafted train which holds picture books in the children’s area. Continue along the highway just a short bit and make sure to turn left at the sign for CHEESE! If you don’t, you might regret it. The Sugar House Creamery is located up the short drive, tucked into the hillside below the imposing cliffs of Ebenezer Mountain. Sugarhouse is home to a herd of Swiss Brown cows, whose milk produces some of the best of our local cheeses. The farm store is open 24/7 (on an honor basis if no one is there). Not only do they stock their own cheese, but raw milk, eggs, yogurt and soaps and gifts. Sometimes you’ll find baked goods, as well as some produce from other area farms. Stroll around and you’ll likely be greeted by one of the owners, Margot or Alex. They love to talk about their farm and cheese and their beautiful brown cows. I attended a really fun annual event there last spring - Green Grass Getdown. It's the day the cows are freed from winter stabling and they see grass for the first time in months! It's seriously a hoot. They kick up their heels and run around the pasture with mooing and cowbells ringing just having an awesome time. Then they get down to the business of eating that beautiful green grass. Seriously it's a great event with live entertainment and food and lots of vendors. It's generally scheduled around mid-May. As you leave Sugarhouse, keep watch on the left side of the road for "the gargoyles." These mythical concrete creatures adorn the driveway of a local resident. And they're famous in their own right. The owners frequently have them dressed up for the season or whatever holiday is coming up. I always look for them. Today they weren't dressed, but they're still rather photogenic. As you drive along the Ausable you'll pass some big open fields and soon arrive at a parking area on the right side next to the river. Make sure you stop here and put your feet in the shallow water, or if it’s a hot day, take a dip. It’s a great swimming hole with huge flat-ish boulders in the middle of the river just waiting for you to lounge and feel that pure, refreshing mountain water wash over you. It's a great spot for a selfie. There’s also a nice, shady picnic table, perfect to sit awhile and eat some of that cheese you just purchased! If you happen to have your bike(s) with you, this section of highway is ideal for a ride, with its ultra-wide shoulders and long flat stretches. As you drive along toward Jay you’ll notice two stone houses next to each other on the left side of the road. One of them is the home and studio of noted Adirondack photographer Nathan Farb. Farb is known for much more than Adirondack photography, but that’s what he’s renowned for in this region. If you ever notice an artists studio tour on the schedule in the Ausable Valley, check to see if his studio is open and don’t miss it! You soon find yourself entering the town of Jay. As you pass by the little post office on the left, keep your eyes open for the Jay Craft Center. Occupying this location for the past 35 years, the shop features Adirondack crafts including pottery and stoneware crafted by the owners, Cheri Cross and Lee Kazanas. In addition, they sell photography, children's toys, books and works by other local artists, including jewelry. You're sure to find a beautiful and/or functional work of art to take home. After you leave the craft shop, continue until you reach the intersection of Route 86 and turn right. Drive about 800-feet and bear right at the triangle. You'll find yourself staring directly into a real live covered bridge! There are three parking spots, so park and make sure to read the history signage and walk through the bridge. It's a great photo spot, looking up or down the Ausable River from inside the bridge through one of it's several windows. The rocks on the upriver side are a very popular swimming hole as well, so if it's a nice day take a dip! 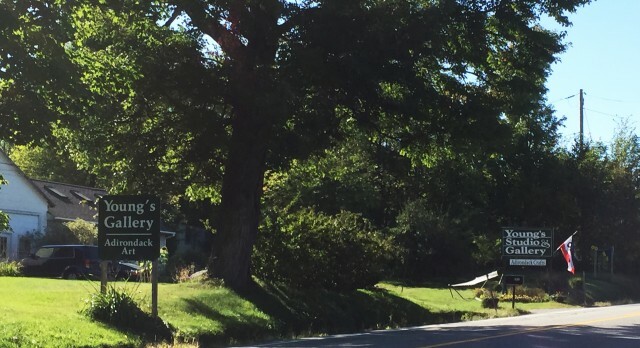 Follow your route back to the main highway and take a right on Route 9N once again. Drive about a quarter mile till you see a deli and auto repair shop on your right. Devins Deli is one of the most popular in the area. AND, they sell cheese. Yes, more cheese, but not just any cheese - aged sharp New York State cheddar cheese. Yup, they have that big ol' wheel sitting under cover on the counter. Ask the kind woman who is in charge of the cheese to cut a slab for you. They also sell lots of snacks and grocery products in addition to deli meats, sandwiches and beverages. Eat some of that cheese right away and you'll know why knowledgeable people always stop here for some of the best ever New York State cheddar! Once again, backtrack to the intersection of Route 86 and 9N and turn right. Route 86 will take you all the way back to Wilmington where you started. Not too far along the road on the right you'll find Rivers Edge Market and Bakery. They sell a variety of market items including fresh baked goods, and organic and locally grown fresh, natural foods. Although I was unfortunately unable to find out first hand as they weren't open when we arrived, I've heard wonderful things about the market, so be sure to make a stop there. I understand they also create a wicked pizza - sold only on Friday nights. I bet they sell cheese too! Another great stop just up the hill from Rivers Edge is Young's Studio and Gallery. Terry and Sue Young are also long time potters and artists, creating beautiful work here for more than 30 years. I own and treasure one of Terry Young's wonderful prints of his etching of Whiteface Moutain. You really must stop at this terrific oasis of creativity. After leaving Young's, you'll wind your way back to Wilmington, a drive of less than 4 miles. 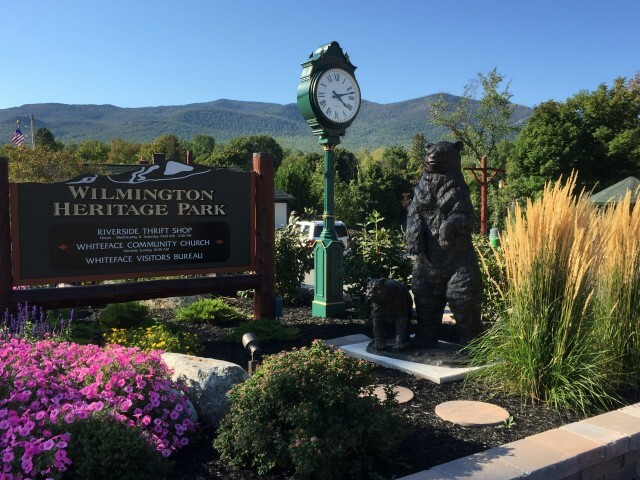 Just past the beautiful welcome sign for the Town of Wilmington is one one of the most spectacular views of Whiteface Mountain, home to Whiteface Mountain Ski Center. You'll be able to see the ski trails very clearly from this vantage point. Looking out over the valley floor with rolling hills and farmland, it's a beautiful and often photographed view. If you want to stop for a Kodak moment, you'll find a small spot to pull off on the right so you don't block traffic and aren't in someone's driveway. Four of the region's greatest attractions are located here in Wilmington - Whiteface Mountain Ski Center, Whiteface Mountain Veterans Memorial Highway, High Falls Gorge and Santa's Workshop - make sure to visit them as well! You should definitely include the Memorial Highway trip in this itinerary! And if it's open, stop at Santa's Workshop, which was partially designed by Arto Monaco of The Land of Makebelieve fame. The best part? The highway has been completely repaved from top to bottom. If you haven't planned a night or two or three in Wilmington or the Whiteface Region, don't delay. This is the perfect time of year to be here to take in the fall foliage and the fall events happening right here! Adirondack newbie tries a cool new Adirondack newbie!